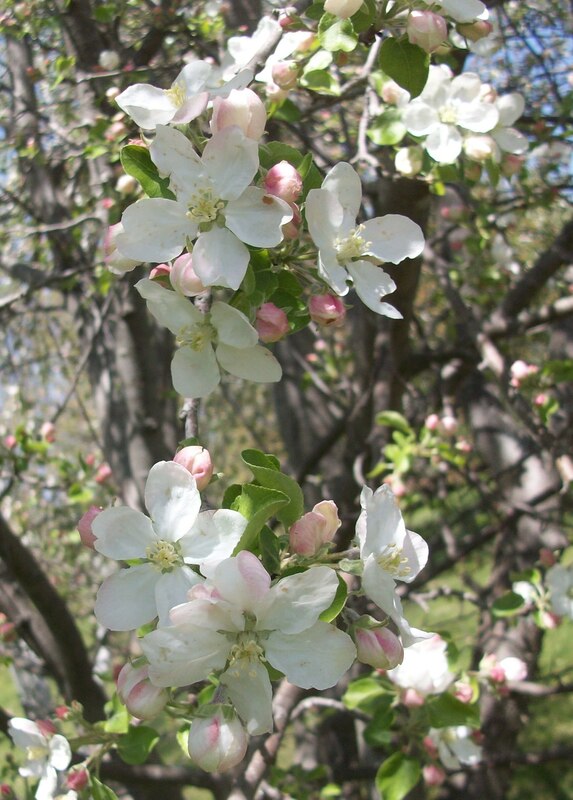 The fruit trees are blooming. The fragrance is sweet and rare. I stopped to breathe it in. Pollinators buzzed, providing hope for a good crop of apples and pears, dampened only slightly by yesterday’s rain. Even the diseased Golden Delicious tree is blooming—perhaps one last crop before it becomes firewood. The newspaper’s freelance garden writer wrote April is the time to get to work in the garden, and so I have. Spinach, peas, lettuce, radishes and turnips are up. The chives and garlic survived both winter and the spring burn. A new pile of apple pomace from the cider mill lies next to the horse manure and grass clippings, ready to turn to compost. There are plenty of weeds starting to grow, needing suppression. If I did nothing else, work in the garden would take all of my time this month and next. In the bedroom, the tomato seedlings are about six inches tall. Seeds sprouted and are growing so that after hardening outside a day or two, they will be ready for planting. At the farm there is less worry about frost and a more diverse crop has been planted. Broccoli, kale, onions and others are already lined up in field rows along with rhubarb and garlic that wintered. I spent part of Friday planting leeks in the field and transplanting eggplant seedlings in the greenhouse. In many ways, April is for a gardener—last preparations for a rush to planting after the last frost. Then a season of replanting and weeding, and eventually harvesting. There are worse things in life than this. This entry was posted in Garden and tagged apples, Garden, local food, sustainability. Bookmark the permalink.